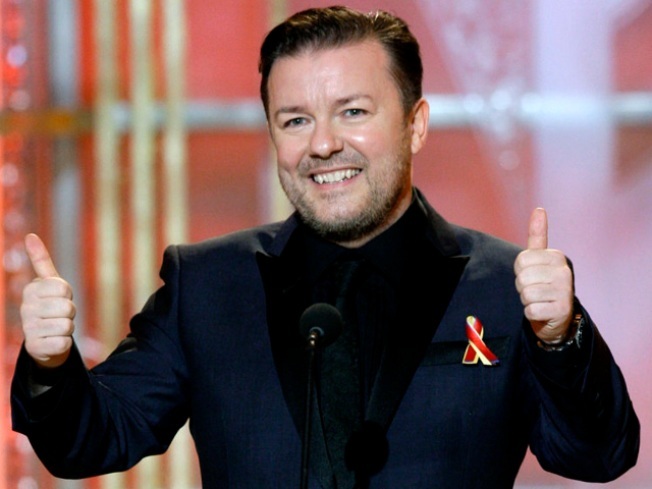 Ricky Gervais turned the 'Globes' into a roast. Ricky Gervais "crossed the line" while hosting the Golden Globes on Sunday night, according to the head of the Hollywood Foreign Press Association, the group that puts on the awards ceremony. "He definitely crossed the line," HFPA President Phillip Berk told The Hollywood Reporter. "And some of the things were totally unacceptable. But that's Ricky." VIEW THE PHOTOS: Golden Globes 2011: Stars Hit The After Parties! Berk attempted to distance the HFPA from some of the comedian's Sunday night barbs, adding, "Any of the references to individuals is certainly not something the Hollywood Foreign Press condones." Gervais, the creator of "The Office" and star of such films as "The Invention of Lying," and "Ghost Town," lambasted a host of people at the Globes, which many critics suggest came off more like a roast than an award's show hosting gig. Among those on his hit list included Charlie Sheen, Hugh Hefner, Tim Allen, Mel Gibson, Robert Downey Jr., Bruce Willis and Berk himself, whom Gervais joked he had to help off a toilet and "pop his teeth in." "Ricky, next time you want me to help you qualify your movies, go to another guy," Berk told the audience following his less than warm introduction. Last week, Berk told Access Hollywood that when he received Gervais' script to review before the event, it was actually just blank pages. "I had absolutely no idea what Ricky was going to say, so anything I heard was heard was the same time you heard it," Berk told THR in a story published on the website on Monday. "When you hire Ricky Gervais, you expect the unexpected." While many of the celebrities on the receiving end of Gervais' jokes weren't prepared with comebacks as the show was going on, Tom Hanks, who was actually given a decent introduction (it was his co-presenter Tim Allen who was lampooned), fought back. "We recall back when Ricky Gervais was a slightly chubby and very kind comedian," Hanks said after being introduced by Gervais at Sunday night's event. "Neither of which he is now," Allen added. While Gervais' comments continue to make headlines, Berk told THR that the British comedian wasn't given a talking to as the show was going on, something many suspected as Gervais' presence in the latter part of the show appeared minimal. "It was always planned that in the section of important awards he was not going to be part of [the show]," Berk said. ""He was never called on the carpet, or given a warning or anything else." Gervais echoed that comment in his own statement, issued on Monday. "I did every single introduction I was meant to. There just happened to be a long gap," his statement read, according to the BBC. "The atmosphere backstage and at the after show was great," he added. Berk had no comment on the possibility of Gervais returning to host the Globes for a third time, next year. Gervais, however, doesn't expect to be asked back. "I probably won't be here next year," he told USA Today. On Monday afternoon, the HFPA issued a statement to Access over the Globes. ‬‪"We loved the show. It was a lot of fun and obviously has a lot of people talking. When you hire a comedian like Ricky Gervais, one expects in your face, sometimes outrageous material," the statement read. "Certainly, in this case, he pushed the envelope and occasionally went too far. The HFPA would never condone some of his personal remarks. Overall, however, the show was among the best we've ever had and we were pleased." PLAY IT NOW: 2011 Golden Globes: James Franco Taking Hosting Tips From Ricky Gervais?